The Ford Raptor F150 is a good looking truck. The muscular lines, the large wheels, and details like the hood air valves and headlight design all make this vehicle stand out as it rolls down the road in Orlando. 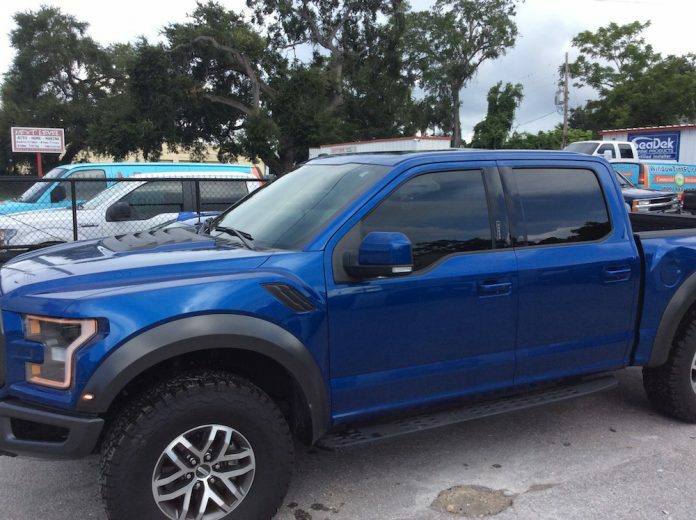 Window tint for a Ford Raptor F150 is the enhancement that can make your truck truly look its best, standing out even from the other Raptors on the road. Take one look at this Ford Raptor F150 we tinted for the proof. The dark windows work so well with the bold blue paint job that it was almost a shame for us to see its satisfied owner drive it away once we were done. While window tint for cars does wonders for the look of any car, truck, or SUV, the fact is that window film’s most important benefits have nothing to do with how it looks, but with how it deals with something you can’t even see: IR and UV light. The ceramic window film we applied to this truck greatly reduces interior temperatures in the vehicle by cutting out much of the hot IR light the sun radiates down daily. And by rejecting as much as 99% of the sun’s UV light, this Formula One Pinnacle window tint protects the cabin from fading. 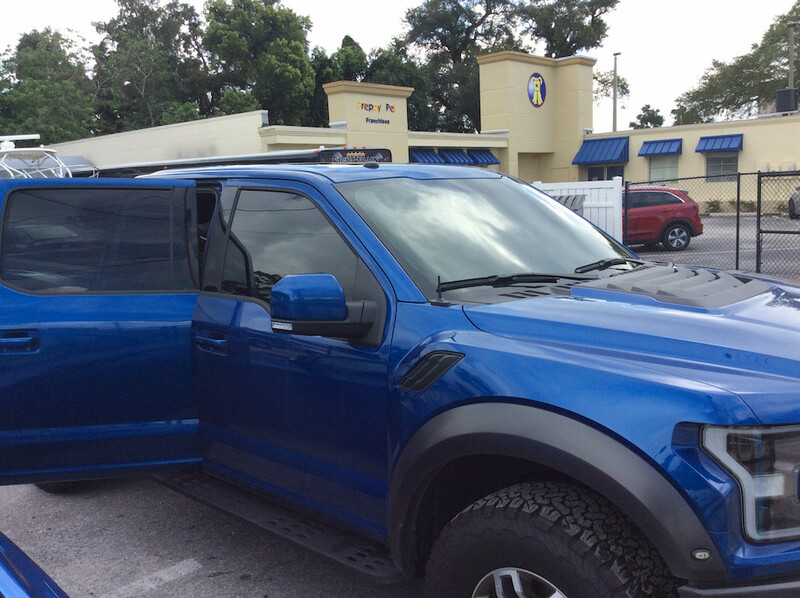 We worked with the driver to choose the right tint for the Ford Raptor F15 and settled on Formular One Ceramic window tint from Llumar because it is a permanent window tinting solution. This tint will never fade or discolor and it won’t lose any of its performance quality even after years of exposure to the Orlando sunshine. This Ford F150 driver can count on a Raptor looking great for years to come thanks to the Xpel Paint Protection film we applied to the exterior of the truck. It will protect the paint from all sorts of minor damage, from scratches to small dents to damage caused by chemicals, tree sap, and more. And if ever the paint wrap itself gets damaged, we can peel it off to reveal the like-new exterior below, and then apply a new layer of clear bra paint protection film to make sure the truck stays protected.